Like a walk over irregular terrain with meditative rolling hills and then perhaps a mountain pass that commands your full attention, our Bias Wrap covers lots of ground. Each end is in twisted half rib, carved into chevron shapes by short row shaping. 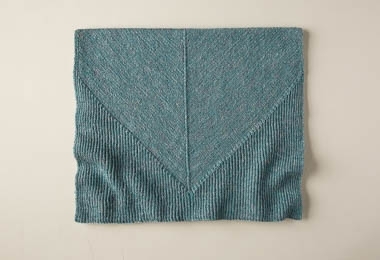 The middle section is a stockinette sprint, knit on the bias, with an increase at each edge and a double decrease in the middle that creates a pretty ridge down the length of the wrap... Very interesting and very fun! To get started, pick up four skeins of our beautiful Linen Quill, available in a palette of over 30 colors, each its own adventure. And for more information about materials, gauge, and finished size, just click product details, above. PLEASE NOTE: This pattern is only available as a PDF download. If you need tips on retrieving your pattern, be sure to check out the first question on our Product FAQs, or email us at customerservice@purlsoho.com. We're happy to help! 4 skeins of Purl Soho’s Linen Quill, 50% fine highland wool, 35% alpaca, and 15% linen. Each skein is approximately 439 yards/100 grams; approximately 1520 yards required. We used the color Vintage Celadon. NOTE: You may only need three skeins... It's close! To be safe, don't wind your fourth skein, and you can return it for store credit within six months of your purchase!